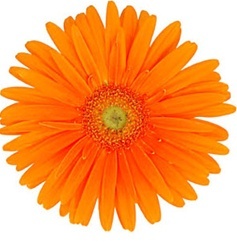 Gerbera Orange - Lt. Center -- A bright orange flower. Gerbera Daisies are favorites, easy to arrange for weddings or special occasions. Free Shipping! 1. If your wholesale bulk gerberas arrived with stems in straws, keep them in place until flowers have had about a day to adjust to their new environment. If they have cups or sleeves, carefully remove them immediately. Many gerberas today do not have straws, sleeves or cups. 2. Cut stem ends to create fresh surface to absorb water and remove any faded stem base. 3. Remove all foliage below the water line and place in a clean container filled with cool water and, optionally, floral preservative. If you do not add floral preservative, change the water and re-cut the stems every day or so. 4. If you have only gerberas in the vase, you can add a drop or two of bleach to the water as an easy way to keep the water sparkling. 5. If you purchased your gerberas ahead of time for a special event, cut the stems and place them in water (and floral preservative if you choose) as above, keeping the stems in straws until the time of your event. 6. Place your gerberas in an area away from direct sunlight until ready for your event. We also recommend cooler temperatures and high relative humidity if possible. Orange - Lt. Center Gerbera Daisies have colorful daisy heads that are nearly flawless in shape. We know many people for whom the Gerbera Daisy is their favorite flower. Their heads are generally 3-4 inches in diameter, with 16-18 inch stems. Sizes may vary with seasons and stage of cut. Our gerberas come with or without straws. If you need straight stems, you can follow the procedures in the video on the main category page, or purchase straws to come with your gerberas. Just gently pull the stem through the straw, being careful not to break the stem. Our wholesale bulk Gerbera Daisy flowers are available in a wide variety of colors, from bold and bright to pastel hues. Properly cared for, our award-winning premium quality Gerbera Daisies have a long vase life. Gerbera Daisies stand alone, or as part of an arrangement for a table centerpiece, wedding bouquet or flower arrangement. FREE Shipping!